Kino Šiška has been the central Slovenian institution of the contemporary concert scene since 2009, further bolstered by activities in visual and performing arts. Back in the good old days and right up until the end of the eighties Kino Šiška was the “only” cinema that played movies. Nowadays, however, it is a unique venue for contemporary and urban creativity dedicated primarily to music, theatre, dance and experimental production, but it is also suitable for meetings, conferences and other related events. 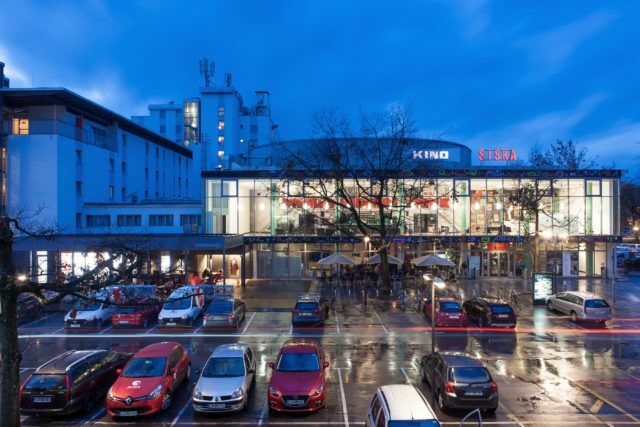 Kino Šiška is set over 2,468 square metres and stands out for its architectural and technological innovation, ranking it amongst the largest and most technically advanced venues of this kind in Europe. Despite having events on throughout the day, most people make their visit to Kino Šiška in the evening when the concerts are on. Whether visiting for a concert or just turning up for an evening drink, the relaxed, almost bohemian atmosphere is a pleasant welcome for every guest. The Hotel Lev is very centrally located, not far from the Ljubljana Old Town and just a 2-kilometre stroll from Kino Šiška. The Grand Hotel Union belongs to the hotel group that also incorporates the 4-star Hotel Lev, featuring 173 guest rooms and 9 function rooms. Meeting planners will be excited by the Karantanija conference hall, located on the ground floor of the Hotel Lev and with its largest conference hall welcoming up to 400 guests. In addition to the upper and lower lobbies (the latter with a coffee shop serving a wide range of alcoholic and non-alcoholic beverages and more than 90 different kinds of beer) Kino Šiška also has two halls, the smaller one (called “Komuna”) with a capacity of up to 200 standing or 120 seats guests and the larger hall (called “Katedrala”), which was the former cinema, having space for 932 standing or 450 seated. Both halls boast excellent technical equipment and have flexibility for different settings. Kino Šiška mostly hosts music events and different kinds of concerts as well as regularly carrying out events from the fields of performing arts and experimental workshops, but the flexibility and other key features of the venue also allow for the organisation of corporate and congress events. In almost eight years of business, Kino Šiška has already hosted a multitude of corporate and congress events, different recordings and television shows, and as a result of its special atmosphere and architectural peculiarities it repeatedly holds shooting and interviews. When hosting an event at Kino Šiška you don’t have to worry about catering, as with their in-house catering it will all be provided for you– food, beverages and anything else you might need will all be taken care of. Incorporating the local offer is something that takes place at several levels – whilst Kino Šiška is primarily a central institution in the field of the contemporary concert offer and complements the visual arts and performing culture, through their programme they support local artists across the various cultural fields and are open to hosting a range of creative potential and creatives. Kino Šiška is located approximately 3 kilometres from Ljubljana Old Town’s Triple Bridge. By foot it takes about 30 minutes, so an easier way is to grab a taxi, take a local bus, or do as the locals do – rent a bike and cycle all the way there through the greatest town park there is, Tivoli Park. Kino Šiška was built in 1961 and is among a number of first-class facilities marked out by their modernist architecture. The building is the work of Slovenian architect Božidar Gvardjančič. When carrying out maintenance work, wall paintings were discovered of the heroes of Steven Spielberg films – E.T., T-Rex and Indiana Jones, which were made in 1993.